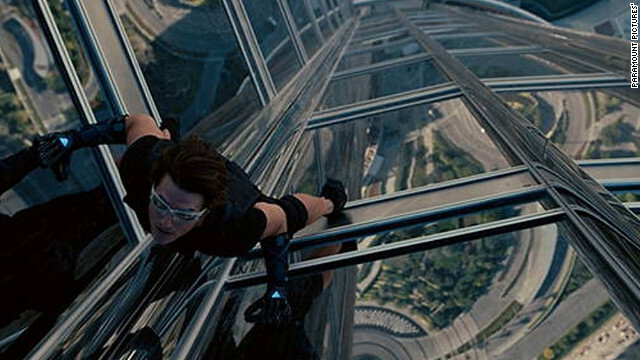 The fourth installment in the Mission: Impossible franchise brought together two of my favorite things: Mission: Impossible and Brad Bird. 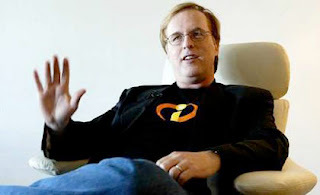 Mission: Impossible, you're probably familiar with...Brad Bird, perhaps not so much. I first became aware of Brad Bird as an avid Simpsons watcher. Bird served as "executive consultant" for 182 Simpsons episodes from 1989 to 1998, the period everyone agrees is are the show's glory years. Listening to the commentaries on those episodes (The Simpsons DVDs provide audio commentary on every single episode) is like listening to the coronation of a king. Bird is renowned in the animation world as something of a story-telling and animation savant, always coming up with the perfect idea or narrative beat for the situation, and a way to work out the imagery. His first feature, the (hand-drawn) animated The Iron Giant, is a critically-heralded and beautiful piece of work. His next two features were for the powerhouse Pixar Animation Studios (Toy Story, Finding Nemo), The Incredibles and Ratatouille. And then, seemingly out of the blue, Tom Cruise and J.J. Abrams hired him to direct the next Mission: Impossible project, his first non-animated assignment. Everyone was curious to see how this animation maven could do with live actors. He did great. 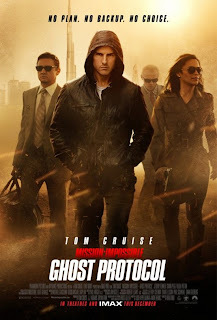 In Mission: Impossible - Ghost Protocol, Cruise returns as Ethan Hunt, head of a team of secret agents (including Paula Patton, Jeremy Renner, and a returning Simon Pegg) who are falsely accused of blowing up the Kremlin. It turns out that a madman (Cruise keeps running into those, doesn't he?) wants to start a nuclear war in order to wipe the human slate clean and start over. The cast performs admirably, although Jonathan Rhys Myers and Maggie Q are missed from M:I 3. Ving Rhames, a staple of the first three films, does show up, but only for a cameo in the coda. The real drop-off,a and maybe the only reason Ghost Protocol comes up a tiny bit short of its predecessor, is on the "villainous madman" front. Philip Seymour Hoffman chewed scenery wonderfully in M:I 3, and the stoic cipher played by Michael Nyqvist can't compete here. He's not bad, he's just not memorable. The star of the show, fortunately, is Bird's camera. Whether he's circling Cruise clinging to the side of the world's tallest building in the face of an oncoming sandstorm or quietly following a cat-and-mouse parlor game exchange of launch codes and diamonds, Bird is in control. A final sequence in a high-tech automatic car-park is almost without equal. The action is pulse-pounding, but always easy to follow. Michael Giacchino provides the score, and his action beats and theme (another derivation of Lalo Schifrin's original classic) are far superior to his occasionally tone-deaf where-in-the-world-are-we scene settings (a loud russian hymn, reminiscent of The Hunt for Red October, annoyingly announces that we're in the Kremlin). As Cruise and his team inevitably triumph, saving the world, we might start asking ourselves why we were so worried that Bird wouldn't do the same.